The LKA show, which was held on 23 and 24 February this year was once again a wonderful example of how the LKA gives their little something special to each show they run. The raffle was a great success with generous donations, raising a sizable sum for the Nairobi Hospice. The show itself was relaxed and well organised, running on time and finishing before dark! Without rainstorms to chase us out, we had a lovely post show social. The critique was scribed (or scribbled) by Judy Seton through 2 dedicated days of work at the show, and is now ready for your perusal. 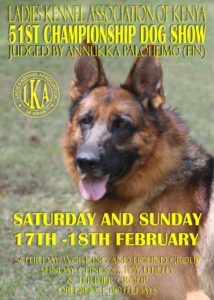 The 2018 LKA Championship Dog Show was Super! 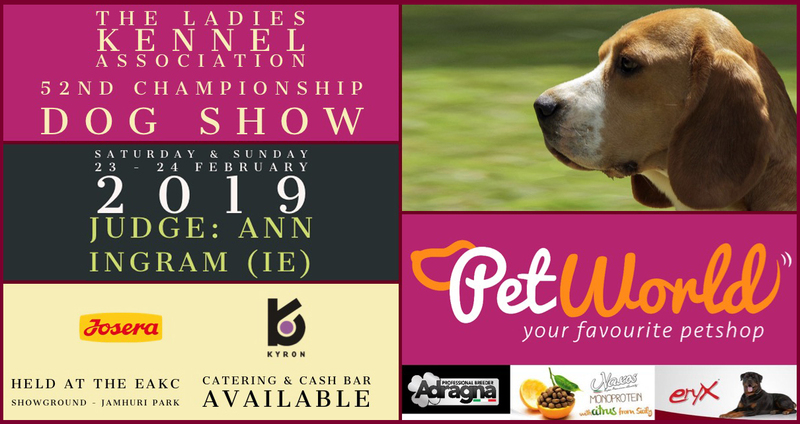 17 & 18 February 2018 The EAKC hosted the 51st Ladies Kennel Association Championship Dog show. The judge Annukah Paloheimo had arrived fresh from Finland the day before, but was ready to go after a restful night enjoying the fabulous hospitality of LKA Chairlady, Barbie Winter. It was great weather having had a few spots of rain in the days running up to the show the parched showground did not look too shabby. The show ran smoothly over the next 2 days with the 250 entrants doing a good job of showing their conformation as well as their character. 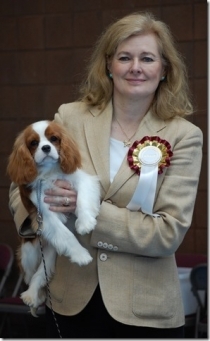 It can be easy to forget that the dogs too suffer stage fright! The morning started with a beautiful line up of boxers, followed by an impressive line-up of GSDs – although we hope to see more of them in coming shows! Dr Moses Wamaitha was a force to be reckoned with with his young imported Golden Retriever winning the heart of the judge who awarded it Dog CC, Best of Breed, Best of Gundog Group, BEST PUPPY IN SHOW, THIRD BEST IN SHOW. Congratulations Moses! CONGRATULATIONS TO THE WINNERS AND A HUGE THANK YOU TO EVERYONE WHO TOOK PART, SPECTATED, HANDLED AND HELPED! The kids of Seeds in His Garden Home were amazing as always! Photo’s of the show are shared on Facebook, click here to view the album. Feel free to email us to request more photos (eakennelclub@gmail.com) we share them only with the owners of the dogs. Thank you Judy Seton’s for your dedicated support at the shows and your magic scribbling! (shorthand) !! !